It looks like there is going to be a new Movie Moment coming soon. 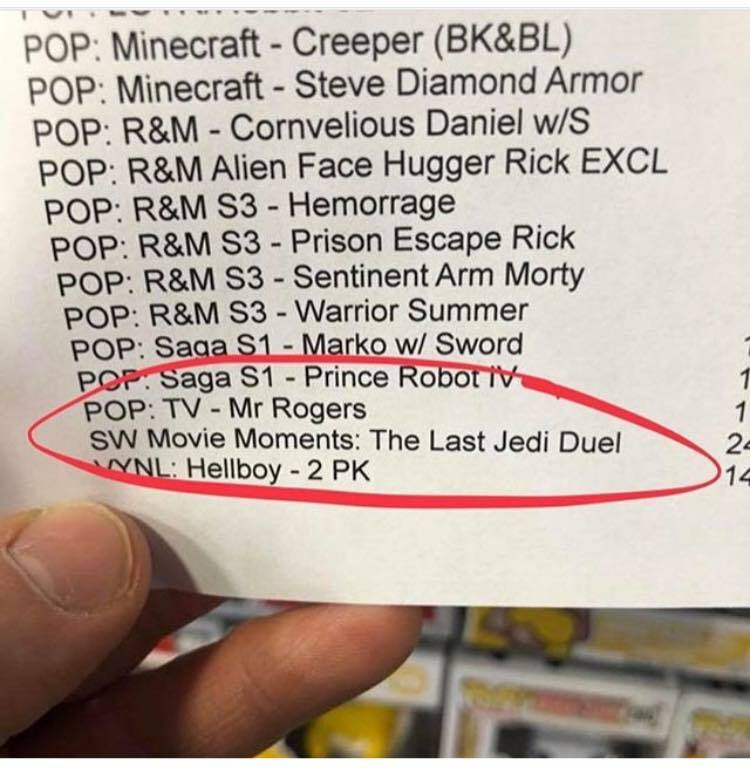 Instead of the iconic Obi-Wan vs Anakin showdown at the end of Episode III, it looks like the newest Movie Moment is going to be much more recent, with a The Last Jedi duel Pop hitting shelves soon. This could be an interesting Pop, since it doesn’t mention which two characters we’re going to be seeing. The Last Jedi, devoid of the classic lightsaber vs lightsaber duels that are the meat of the Star Wars franchise, has Rey teaming up with her nemesis Kylo Ren to take out Snoke’s elite Praetorian Guards, while Phasma squares off against Finn in an a desperate act for revenge, considering the last time they met, he helped dump her down a garbage chute. Considering the complexity of each scene, I’m hoping to see a Finn vs Phasma showdown, especially since both fans of both Finn and Captain Phasma have been a bit disappointed in The Last Jedi wave. Currently, the only TLJ Finn Pop released has been him in his First Order disguise, while Captain Phasma was merely repackaged in a different box and is the same physical Pop as her The Force Awakens variant. If we’ll see more of them as individual Pops, it’s difficult to say. Funko has hinted that there are more TLJ coming, but it’s hard to say if there will be an official second wave, possibly in time to the Blu-Ray and tie-in novel release in late March, or just released sporadically throughout the months leading up to Solo, hitting theatres late May. Right now there’s no word of when this Pop will be hitting stores, or even where. While the first Movie Moment revealed was a Walgreens exclusive, the last four were given to Walmart. My gut tells me they’ll stick with Walmart, but anything’s possible.